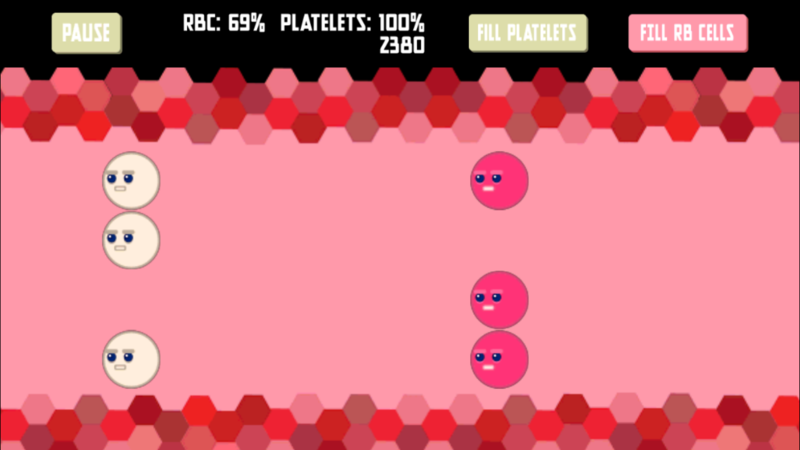 An educational game about Acute Myeloid Leukemia (formerly called Blast Those Blasts). In the human blood stream, there are three kinds of cells, the Red Blood Cell (RBC), the Platelet (PLT), and the White Blood Cell (WBC). Each of these cells has a different use to the body. The RBC carries oxygen to your muscles and vital organs, the PLT makes your blood clot so you don’t bleed, and the WBC prevents infection. When someone has leukemia, the WBCs are immature (don’t fully form) and fill up space. There isn’t any room for the other cells to grow. That is why when people get leukemia their blood doesn’t clot (no platelets), they get infections (no white cells), and they feel weak (no red cells). These not-fully-formed versions of WBCs are called myeloblasts (“blasts” for short). The most commonly used treatment for leukemia is chemotherapy, which uses certain drugs to get rid of the blasts. Chemotherapy also sometimes gets rid of the good cells like platelets and RBCs, which is not good. In this game, you have to balance destroying the blasts (blasting the blasts) without killing too many of the good cells.